We are the foremost manufacturer, supplier, exporter and importer of a premium quality assortment of Quantum Energy Flask. 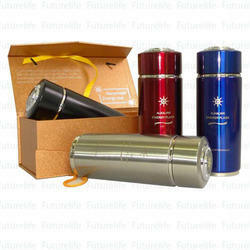 The offered flask is manufactured using best quality material and sophisticated technology. This flack is designed keeping in mind the needs of the clients and are up to the international standards. Our product is available at industry leading prices to our esteemed clients. We are presenting our valued customers a broad gamut of Quantum Energy Flasks including Quantum Energy Flask. It is designed to rearrange water molecules into smaller clusters to improve bio-availability of water at cellular level and thereby normalize complex physiological functions of human body. It is also shown to offer protection to DNA from the possible damage due to electromagnetic waves. It is made from the finest raw materials and is compact in size. We maintain stringent norms of quality that are in adherence to well defined industry standards. Our clients can avail this at reasonable prices. Looking for Quantum Energy Flask Importer in India ?